When the legend becomes fact, print the legend, not the fact. This dangerous aphorism from The Man Who Shot Liberty Valance was used in the introduction to a Springsteen biography I read many years ago, but the timing was unfortunate; right about the time I was reading the final chapters, describing in loving detail his marriage to Julianne Phillips, the news broke of his relationship with backing singer Patti Scialfa. It served as an early warning that passion, whether written, music or any other form, has little bearing on that truth that exists outside of art. I sometimes think of this when I read the comments section in The Guardian or, if I’m feeling really brave, an article in The New Statesman. 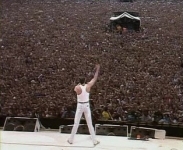 For whilst I remember the 1980’s as a time of great upheaval, terrible hardship for some and excessive greed by a few, I also remember the Free Nelson Mandela concert, Live Aid, Children in Need and unprecedented levels of charity. It turned out that given economic freedom most were more than willing to do the right thing, yet much of the recent ‘history’ paints a colourful picture of cartoon villainy; beware the evil Thatcher beast that would ‘cheerfully’ destroy communities and ‘gladly attack’ the poor. A litany repeated whilst staring down those who would point out the folly of this thinking seems designed to silence the critics - for who would be associated with such monsters? I would. I have my truth. What's yours? yep. That's one conception of truth. We find that in the hen house, too. Might makes truth; peck until you have control. I hate that especially among those who would speak for me. Just because they say they agree with the same issues that I would doesn't mean I agree with them.